Ginger (Zingiber Officinale), classified as a herb, is a flowering plant with long green stems and leaves. The swollen ginger roots have been widely used in traditional medicine and as a spice in tropical cuisine for centuries. Although often referred to as a root, ginger is an underground stem called a rhizome. The rhizome is branched with small “limbs”. The brown skin is thin if harvested when young, but thickens with maturity. The color of the flesh varies from pale yellow to white or pink, or even red, depending on the variety. 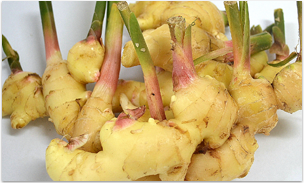 Young ginger is fragrant, pungent, fleshy and juicy with a mild spicy taste. As it matures the rhizome becomes more fibrous, drier and also tends to be spicier than its younger counterpart. A recent study showed that young ginger brings down body temperature as in the case of fever. Whereas the old (dryer) ginger brings up the body temperature as in the case of a cold and suitable during winter. When undertaking an extended juice feast, I recommend the use of old ginger for this reason. Ginger has at least twelve types of antioxidants, making it useful for treatment of a wide range of disorders. Ginger contains essential oils, protein, calcium, phosphorus, iron, vitamin C, choline, folate, inositol, manganese, panthotenic acid, silicon, and a small amount of vitamin B3. It is used widely for its medicinal properties, and has aphrodisiac properties. If you can stomach the spicy heat, ginger works wonders in treating many disorders. Ginger is an anti-coagulant: Ginger reduces the stickiness of blood platelets, which in turn reduces your risk of stroke. Add fresh to your cooking or add a teaspoonful of young ginger juice in your beverages to enjoy the anticoagulant properties. Ginger has aphrodisiac effect: A natural aphrodisiac, ginger just might be a healthier, natural substitute to viagra! 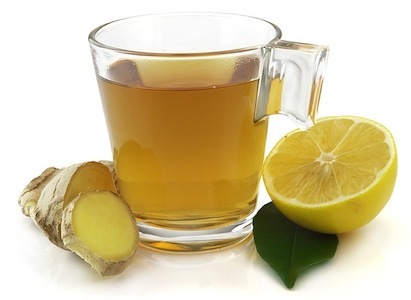 Drink hot as a herbal tea (by mixing ginger juice, hot water and raw honey) after a not-too-heavy meal and see it work! Ginger can fight off common cold: A ginger infusion is an effective way to relieve fever and flu symptoms or fight off a cold. Cut or grate a small piece of mature ginger and infuse in hot water for 5 minutes. Add some green tea leaves if you wish. Strain and drink when hot. Relieves tingly cough and sanitize the throat: Drink ginger juice with raw honey three to four times a day for a bad throat and tingly cough. It is soothing and helps clear up phlegm. If you have a dry cough, use the young ginger. If there is phlegm, use the nature older ginger. 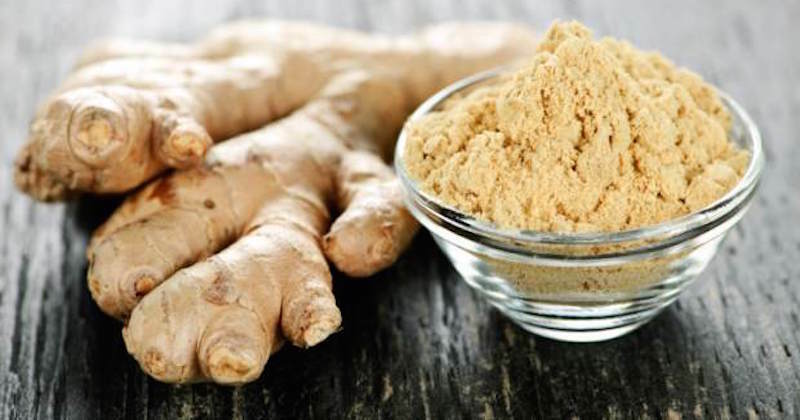 Combat cysts and mastitis: Ginger compress is a very effective way to naturally reduce and eliminate cysts and mastitis. Treats digestive disorders: Mix a teaspoonful each of young ginger juice, fresh lime juice and fresh mint juice with honey to taste in a glass of water. Drink to relieve heartburn, indigestion, nausea and vomiting. This is especially helpful after a big meaty meal. Relieves fatigue and invigorate: Ginger has warming and invigorating properties. It also relieves muscle pain and soreness. Slice a piece of ginger into disks and boil it with a big glass of water. Add a piece of cinnamon bark, bring to boil and then cover it for about half an hour till it turns to golden color. Drink it to relieve fatigue when recovering from fever. Relieves flatulence/wind: Pound a piece of fresh ginger and boil with a cup of water and add a little honey to taste. Drink it twice a day to let off the wind trapped in the intestinal tract. Headaches: Drinking lemon-ginger tea will help to relieve headaches as it encourages blood circulation and supplying oxygen to the brain, reducing the pain. Adding ginger to your diet regularly will stop chronic headaches. Inflammation: The anti-inflammatory (gingerols) and anti-oxidant properties in ginger help relieve various inflammatory disorders like gout, osteoarthritis, and rheumatoid arthritis. It provides substantial relief in pain caused by inflammation and help decrease swelling and morning stiffness. Menstruation disorder: Pound a piece of young ginger and boil with a cup of water and add a little honey to taste. Drink it hot two or three times a day for a month. The pain-relieving and anti-cramping compounds in ginger effectively help relieve painful menstruation cramps (dysmenorrhoea). In the absence of menstruation in women in the reproductive age (amenorrhoea), this concoction can also help induce menstruation. Morning, sea and motion sickness: A teaspoonful of young ginger juice with some honey will help alleviate morning sickness, sea or motion sickness, dizziness and even nausea caused by chemotherapy or anesthesia. Pain killer: Ginger juice makes an excellent pain killer, even when applied externally. For headaches, apply the juice to the forehead. For toothache, apply to the external area of the cheek or jaw area. Stomach ulcer: Ginger juice added to your daily juice will gradually heal stomach ulcers. Avoid/limit consumption of processed foods that aggravate the ulcers. Cabbage juice is also helpful to completely heal stomach ulcers in a very short time. Use a teaspoon to scrape off the ginger skin. When adding ginger in cooking, add at the beginning of cooking for a milder taste, or near the end for a much more pungent taste. Add a little (about 1 tsp) fresh ginger juice in your vegetable or fruit juices whenever possible. Start with a little and gradually increase the amount according to your taste. Ginger is pungent but it gives your juice that “extra kick”. Lemongrass and ginger detoxifying tea that is has anti-microbial effect, beneficial for individuals suffering from yeast infection. Warning! Do not give ginger juice to young children, or honey to infants! Fresh ginger juice is very potent as it contains high levels of active enzymes and substances. Only a teaspoonful is needed to feel its efficacy in treating disorders. Ginger juice is spicy, so go slow with it if you are not used to its spiciness. Side effects can be flatulence and uncontrollable burping. This doesn’t mean that the juice causes gas, but rather that the consumption causes the body to release trapped gas in your intestinal tract. More does not mean better. Ginger does contain moderate amounts of oxalate. Individuals with a history of oxalate-containing kidney stones should avoid over-consumption. The hot, pungent, spicy taste and scent of ginger comes from essential oils and phenolic compounds such as gingerols and shogaols in the rhizone. Gingerols act in a similar way to capsicum (responsible for the heat in chili peppers) in the body, but to a far lesser extent – hence ginger is not hot like chili. You can find ginger in the fresh fruits and veg section easily of most supermarkets and health food shops. Make sure that is does not look dry and wrinkly (which means it is old). Look for rhizomes with the beginning of new shoots growing – this means that the rhizome is healthy and growing – it will last far longer in the kitchen, and could even be planted at home for cultivation. Store ginger in a cool dry place, out of direct sunlight. Try and consume while still fresh – it will shrivel and dry out with time, but rarely go moldy unless stored in a damp place. You can slice off chunks of ginger as required. The cut will deal and dry out within a few hours. I suffer from Raynaud’s so am hoping root ginger will help improve my blood circulation.